Balloon races are popular throughout the world, especially during summer months. We are often asked, “How do balloons race? The term ‘racing’ may not be the best choice of words when talking about balloon competitions because balloons don’t ‘race’ in the normal sense of the word. It isn’t a ‘first across the finish li ne’ endeavor. In their simplest form, balloon competitions score how close a pilot can get to a pre-determined target. Small weighted markers are dropped at the target. The challenge is to be the closest to the target, but unlike all other forms of flying, balloon pilots do not have direct control of their direction of flight. The balloon simply drifts with the wind. Competition pilots have become quite skilled in reading the winds aloft and using them to their advantage to get where they want to be (the target!). Competitors have gotten so good that the difference between first place and third or fourth can be fractions of an inch. 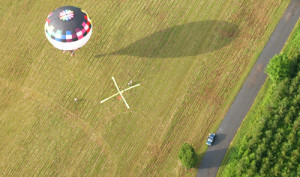 The target X is placed in a secure area, usually the festival site. The balloons can launch anywhere they want as long as they are outside of a predetermined radius from the X, usually 1, 2, or 3 miles. Pilots fly in, drop their markers at the X, and scoring is based on the distance from the center of the X. A Key grab is nearly identical to a CNT, but instead of an X at the target, a pole 10 or 20 feet high is the target. A detachable ring is fastened to the top of the pole. The first pilot who removes the ring wins the prize. Prizes can be almost anything; new cars, cash, and even new balloons have been given away! An X for a CNT is often placed near the pole and the two tasks are flown simultaneously. Throw your marker and grab the ring – you can do quite well in a single flight! The judges define two scoring areas. The task is to drop one marker in each scoring area, with the shortest distance between the two markers achieving the highest score. Watch out, though – in an effort to get your markers as close together as possible, one marker might drift outside the boundaries of a scoring area, resulting in no score. Pilots take off from a common launch point (point A) and fly to a judge declared goal (point B). One marker is dropped at point B. The pilot then tries to change the direction of flight and drop a second marker at a point (point C) that will result in the smallest angle between point A and point C.
The competition director will assign pilots to drop markers at multiple targets of their choice. Targets are usually road intersections or road – railroad intersections. Sounds easy! But the targets must be identified by their map coordinates. The first target’s coordinates must be declared before launch, the coordinates for the second target must be written on the tail of the marker dropped at the first target, and so on. Errors in writing down the coordinates or choosing a target that is difficult to get to can cost precious points. As you can see, balloon competitions can be very challenging. Serious competitors use very sophisticated computer programs to track wind speed and direction before they fly, and use GPS (Global Positioning System) receivers in the balloon during flight to assist in determining the best altitude to fly to get to the next target. In the early days of competition flying, some pilots felt lucky to drop a marker within a hundred feet of a target. Today, the center of a target can have dozens of markers within a foot of its center. Sometimes penalty points or a rules violation can make the difference between winning and losing.